My Stock Boss CS-3 ready to mod. 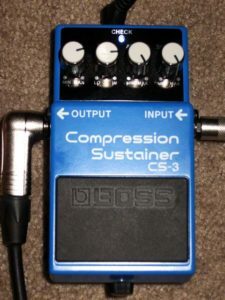 After my successful attempt to modify my old Boss DS-1 Distortion pedal I thought I would have a go at making my Boss CS-3 Compression/Sustainer a quieter pedal when sustain levels are set high. I found some resources at Indy Guitarist on the Boss CS-3, and how to lower the noise and hiss levels of the pedal, as well as alter the tone of the pedal. I decided to try out the modifications to lower the noise level, which involved swapping out four electrolytic capacitors and replacing them with some sort of metal film or film capacitors of the same value. 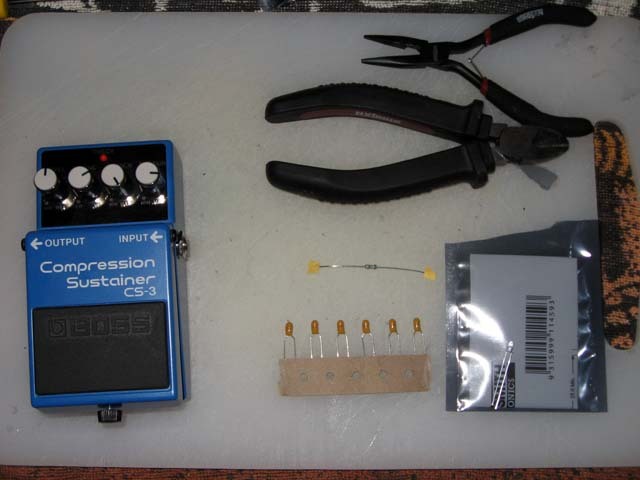 I also decided change out two resistors that affected the pedal’s clean headroom and added more ‘body’ to the tone. For ultimate mod cred I would also replace the standard red ‘on’ LED with a blue one. I ended up using 1uF tantalum capacitors in place of the 1uF electrolytic ones. The voltage rating on the electrolytic types were 50Volts, but the highest 1uF tantalum capacitors I could find in my local electronics store were 35V. I determined that these should be fine for my application. The pedal is designed to run on a 9Volt battery or power supply, so as long as the capacitors I was using had a Voltage rating of at least double that (18Volts) I should be well and truly safe seeing as I had plenty of headroom from the 35Volts. With regards to the resistors I was replacing two tiny 10K resistors with larger 470Ohm and 100Ohm metal film ones. I decided that I would start on replacing the LED. When I did my DS-1 mods I found it one of the most painful parts, so I thought I would get it out of the way. Accessing the LED's mini PCD. The LED has it’s own little mini PCB, separate to the main one. It’s a little fiddly unscrewing it from it’s mounting point, but that’s not the real issue. Trying to de-solder the points the LED attached to is extremely fiddly due the PCBs tiny size. i found that I could screw it to one of the corners of the base of the pedal to keep it a little more stable. Whilst doing this makes things a lot easier, it’s still a tough one to work on. The solder also seems to be very built up on the LED. Maybe it’s just my cheap 25W soldering iron, but it takes a very long time to remove enough of the solder off the board and the LED legs to slide the LED out. Be careful during this that you don’t take too much off, and lift the points completely. I noticed a little of the brown base where I had been a bit overzealous with my soldering iron and de-solder braid, but i still had plenty left once I had removed the original LED to replace with the new shiny blue one. Remember that LEDs are polarised, meaning that they have a set negative and positive leg. Typically polarized electronics commonly have a longer leg for the positive side, but the LED I bought seemed to have identical length legs. I just slide the LED into the holes on the PCB, bend the legs enough to touch the edges of the holes, and test with a power supply and cable plugged in the input. If the light doesn’t come on then the alignment is wrong and you need to swap the LED around. Once the alignment is sorted solder the LED in place and test to make sure the light comes on. CS-3 with it's new blue LED. At this point I’ll say that it’s definitely a great idea to test your pedal after each change is made. Don’t chop any of the components legs until you are sure that you have it installed correctly, and the pedal is operating when engaged. Once you have successfully tested it chop the legs down to the solder points. Now it was time to move on to the capacitors. Some capacitors are polarised, and some aren’t. 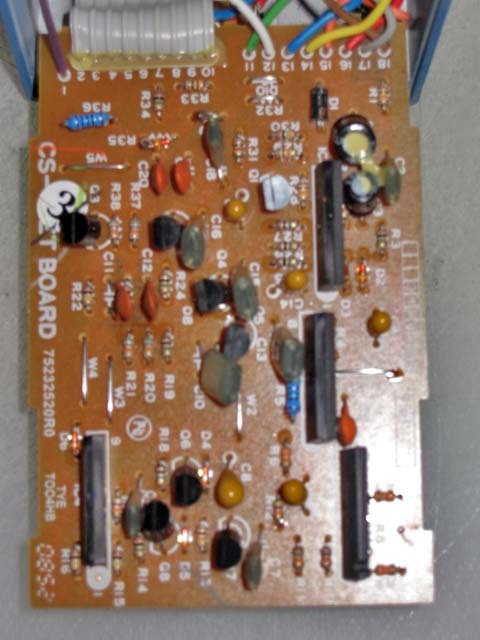 It is extremely important that you determine if the capacitors you are replacing are, and ensure that your replacements are as well. 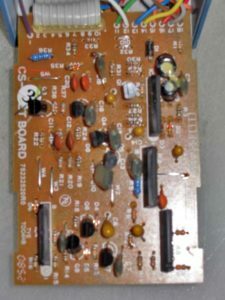 The electrolytic capacitors being replaced are polarised, and this is marked by a stripe down one side of the capacitor, indicating the negative side. Thankfully with BOSS PCBs they show on the PCB the negative point by putting a white circle around the negative hole. As mentioned with the LEDs, many polarised items will have a longer leg on the positive side, but not always. The tantalum capacitors I was using to replace the electrolytic have a ‘+’ sign to indicate the positive side. 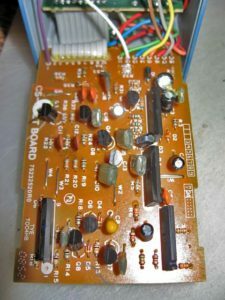 Ensure that that this side of the capacitor is going in to the hole WITHOUT the circle around it for correct alignment. If you incorrectly align the capacitor it could very well blow. Something you definitely don’t want happening! The capacitors you want to replace for this mod are the c4, c6, c14, and c17. Thankfully most Boss pedals have each component clearly marked out with this numbering system. Replace each electrolytic capacitor with the tantalum equivalent one at a time, testing after each solder to ensure the pedal is still working. 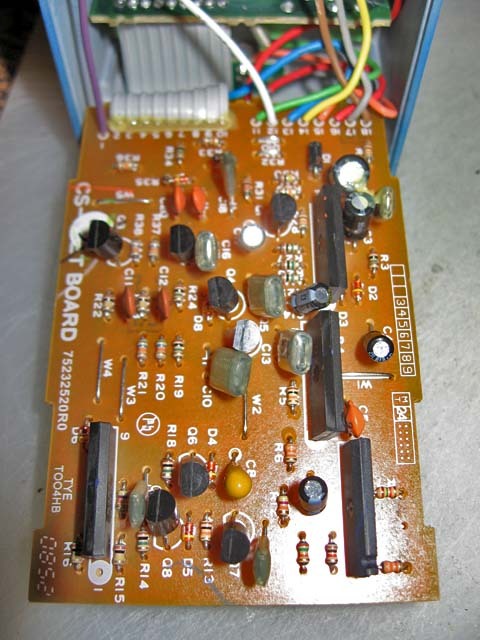 If it’s not working properly (and the capacitor hasn’t been installed around the wrong way) the chances are the solder hasn’t bonded properly with the component and the PCB. A solid, correctly soldered point should be nice and shiny, whereas a bad solder point will be quite dull. If it’s bad then head the solder up again, and add some more if needed. After installing all four new capacitors you should find that your pedal sounds pretty much the same as it did originally, with less noise and hiss. I then removed the R5 10k resistor, and put in it’s place a 470Ohm one. Resistors are not polarised, so you can install them in either way. Installing the new item was a bit of a challenge as it is a bit bigger than the original item. The resistor is longer than the space between the two holes, which means you need to bend one leg a bit so the resistor sticks up on a bit of an angle. Just take care not to break the legs when doing this. I then followed up with replacing the R36 10K resistor with a 100Ohm replacement. It is the same size as the 470Ohm one, so again it’s just a matter of carefully bending the legs a bit so the resistor is raised off the PCB a bit. After installing the resistors I packed the PCB back into the enclosure and bolted on the bottom of the pedal, ready to take the pedal for a test drive. The modified CS-3 does sound a little quieter on higher level and sustain settings. The tone also seems to be a bit richer and fuller too, thanks to the resistor changes. Overall it has a more pleasing tone to the ears, it’s not a noticeably different sounding pedal, but the modifications seem to have had a positive impact to the pedal. 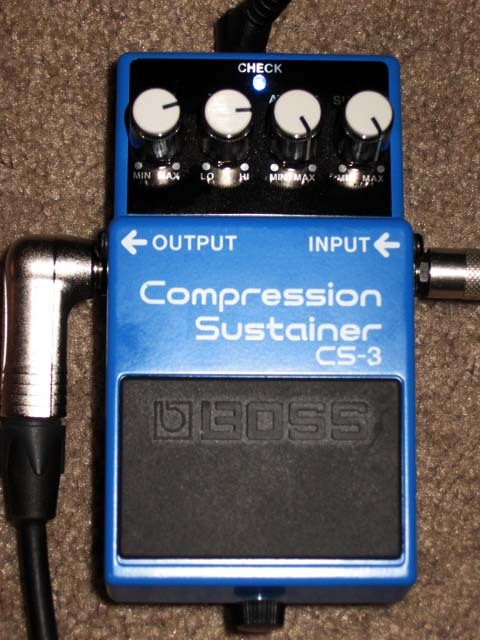 Below are links to samples of the CS-3 mods in action. My recording configuration is a little basic, with the direct out on my Blackstar HT-5 plugged in to the audio in port of my PC’s soundcard. The samples are a little rough sounding, but I hope they give you an idea of what the pedal sounds like. The first sample is through the clean channel of my amp, and the second sample is through the dirty channel. Both samples have pretty much the same settings on the CS-3. Please excuse my rough playing as well. I didn’t seem to pick the best day to record my guitar playing abilities (or lack thereof)! 7 Responses to "Modding the Boss CS-3"
i’m about to buy this pedal (though I’m not sure I will just yet) and modding it sounds like the way to go!! It’s not a bad pedal for the money, especially after modding it. It’s still a little noisy at high settings. You have to replace the chip on the board to sort that out though. After completing these mods it is a bit quieter though. 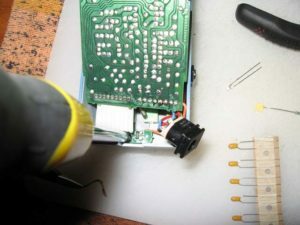 They are pretty easy to do as well if you’ve used a soldering iron a little you should be right to give this a go yourself. Just take care and it should all be good. oh yeah no problem, i already changed pickups and stuff, so i’ve been around a bit… you see, i’m an aspiring sound engineer, so your blog is like a little piece of heaven to me *. * anyway, keep them coming! I get the impression that you have a bit of electronics experience and was wondering if you might have some knowledge of the ASA/PSA ac adapter issue[s]. I have one of the MIJ [black label] CS-3 pedals and, even after removing the R32 & D10 components I can’t get the PSA-230s adapter that I have to work at all. Before removing the parts I got a very dim light and the sound was buzzy at best. Now I get nothing. No light. No sound. No signal. What’s confusing is that after doing the Monte Allums mod, which requires that those be removed, I’m not sure at what voltage this pedal is running at. 9V? 12V? I know the mA are very something like 11mA so I’m not even sure I can find a universal ac adapter either. Anyway, thanks for any help you might be able to offer. I’m sorry, but I’m really a bit of a n00b myself, and just learn and experiment as I go. Your pedal should from memory run on 9 volt, it should say on the label on the back of the pedal. Check out freestompboxes.org and diystompboxes.com for further assistance. A search of the forums should give you the answers you need. hello, the resistors that you used are how many wats . Hi there, sorry I missed this. The ones I’ve used are 1/2 watt.